With today’s architectural trends of more glass in commercial buildings and soaring utility costs, solar window tinting has become a necessity. Working in an unprotected, west facing office in the Georgia heat is almost unbearable. Solar window tinting can cut utility costs and increase productivity for a win-win situation. Scott's Mobile Window Tinting Goal is to help you achieve the ultimate in energy efficiency with special window films utilizing specialty metals. Available in a wide range of shades and light densities, these films are spectrally selective, that is, they allow considerable amounts of visible light to penetrate the film while excluding much of the sun's heat. 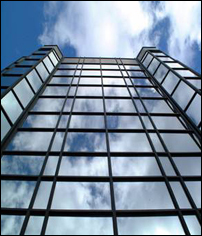 Commercial building owners substantially reduce utility bills by simply applying solar control window films. Most solar control films can pay for themselves through the energy savings in approximately two year's time, and carry 10 year warranties. Levels of efficiency are so high that many utility companies offer incentives or rebates for the application of window film. Productivity in the workplace increases as glare is reduced and hot and cold spots are eliminated. In many cases privacy increases and the buildings facade acquires a uniform, aesthetically pleasing look. Window films eliminate up to 99% of ultraviolet light, greatly reducing the fading of furniture, rugs, and other fabrics. Increased Safety. As you may know, sunlight also contains harmful ultraviolet rays. These rays can harm your eyes and skin among other things. Fabrics and furniture placed near a window will fade over time. Many window films will block out as much as 99% of ultraviolet rays, saving you and your furniture from these harmful rays. In addition to all these other issues, window films can increase the safety of glass, preventing it from creating sharp shards when broken.